What causes bubbles in your urine? You can't overly ignore it since various normal and abnormal conditions can cause urine to bubble. The presence of bublle in your urine is not always a sign of an underlying medical condition. Here are some benign conditions that can cause urine to bubble. During pregnancy, some women experience kidney enlargement. This enlargement can result in urine that bubbles. Furthermore, during pregnancy a woman's kidneys must also filter higher amounts of amino acids. When the amount of amino acids exceeds the renal tubules ability to absorb the acids, protein can escape into the urine. Protein in the urine can cause the urine to bubble. Mild dehydration can result in bubbles when urining. This occurs because mild dehydration causes the urine to concentrate and highly concentrated urine tends to bubble. Because people with diabetes are at high risk for dehydration, they may experience bubbles in their urine more often than those who do not have diabetes. Maintaining adequate hydration levels will reverse this finding if the underlying cause is truly mild dehydration. Urinating rapidly can result in bubbles when urining. Dehydration can cause people to urinate rapidly. so increasing the level of hydration can help reverse this finding. There are times when bubbles in the urine are indicative of medical disorders such as kidney disease or urinary tract infections. Here are some conditions that can cause frothy urine. However, frequent bubbles in the urine could be a more serious condition where the kidneys fail to function properly or a medical condition interferes with the body's ability to metabolize protein. Normally, when blood passes through healthy kidneys, all waste products are removed, leaving only the materials the body needs. However, in individuals with kidney disease or damaged kidneys where the glomeruli, the part of the kidney that normally filters urine, are damaged, protein from the blood can enter the urine. The underlying cause of bubbles in the urine related to proteinuria must be diagnosed before the symptom can be treated. If the cause is related to excess protein intake, then reducing the amount of protein in the diet will reduce or eliminate bubbles in the urine. Urinary tract infections can also cause urine to bubble. In this circumstance, the bubbles result from microorganisms entering into a sterile urinary tract that releases a gas, which results in bubbles. The bubbles found during urination are often accompanied by pain or a burning sensation. This condition needs to be assessed by a physician who can order a urinalysis to determine whether an infection is present. If a diagnosis of a urinary tract infection is made, then the bubbles in urine should disappear after the infection is treated with a round of antibiotics. A fistula is a connection between two organs or blood vessels that does not normally exist. A vesicocolic fistula can form between the bladder and colon and is more commonly found in men than in women by a 3:1 ratio. When bubbles form in urine due to a vesicocolic fistula, it is called pneumaturia. In this case, bubbles are introduced into urine when the base of the bladder becomes inflamed or swollen and the surrounding fluid builds up under the skin. The bubbles contained in the fluid are then released in the urine. In this case you should consult your physician to uncover the exact cause of the bubbles. Some people fail to differentiate between bubbles in the urine and foamy urine. Frothy or foamy urine is often just a result of forceful urination that comes from ignoring the need to urinate. 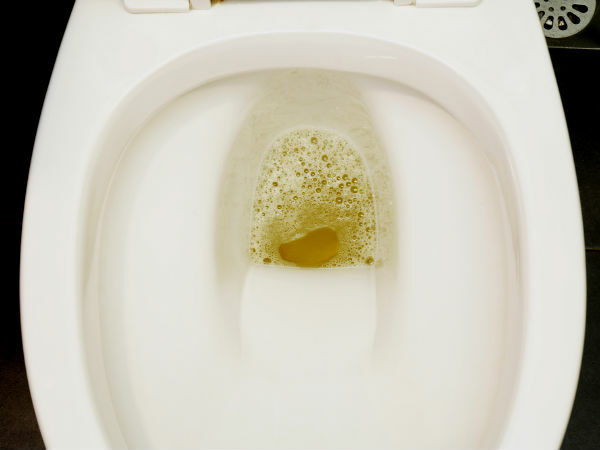 The foamy appearance of urine in the toilet bowl is a result of excess air getting trapped in the urine. However, if the urine is consistently foamy, there may be protein in the urine, which can be indicative of kidney disease. If you consistently have foamy urine, it is important that you consult your physician to rule out potential kidney disease.